I was so, so ready to love this book. Ever since I saw that cover and read the blurb, I'd been anxiously awaiting its release. I mean, just look at that stunning cover and tell me it doesn't make you want to read it. But the story didn't hold my attention, and I blame it on two aspects: Roar and the love triangle. Let me just make it clear: I don't usually have a problem with love triangles. I mean, as a professional shipper, I'll always have a problem with a love triangle when the main character picks the wrong guy (or girl), but that doesn't mean I won't give the book a fair shot just because it features a love triangle. The thing with Roar was that it failed to make that aspect interesting. I'll confess that Cassius pretty much stole my attention from the start, leaving little room for Locke. And Locke didn't do anything to change that fact. He simply didn't stand out enough. Cassius, on the other hand, had the whole anti-hero thing going for him, and I can hardly resist that aspect. The problem with that was that Cassius didn't get half as much screen (or is it book?) time as I wish he had. Once Roar met Locke and ran away from the castle, we'd only get a few chapters with Cassius, and they weren't nearly enough for me. Sure the story isn't about him, so I shouldn't be too upset about it. It wouldn't have been such a problem if I had liked the main character, Roar/Rora/Aurora. Problem was, I actually didn't. Roar was okay at first. I could understand her dilemma: marry someone she believed was manipulating her in order to keep her secret, or throw caution out the window and go looking for the kind of power that would allow her to stand up for herself. As a fan of strong female heroines, I pick option two every time. But I need the heroine to be careful about how she goes about picking that option. If she does it at the cost of someone else's life, freedom or happiness, then I probably won't like her much for it. And Roar made that mistake. In order to run away with the hunters and go after the storm magic she wasn't born with, Roar asked for Nova's help. Nova, unlike Roar, is a much more interesting character, but that's beyond the point here. The thing is, Roar had spent the past few years staying away from everyone, including Nova, who used to be her friend when they were kids. And now that she's in trouble and is desperate to find a solution to her problem, she turns to Nova, who's also a ser her servant, and asks for the kind of help that can put the girl's life in trouble. Since Nova has such a good heart, she agrees, but that doesn't mean I can overlook the fact that Roar doesn't even seem to register the danger she's putting her "friend" into. She just acts like a spoiled rich girl and goes get what she wants, leaving her friend to deal with the mess she's leaving behind. And poor Nova obviously pays the price for her loyalty. That really annoyed me. 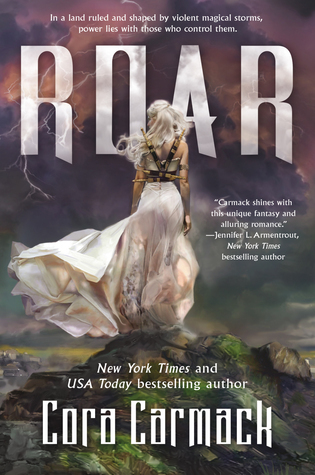 I honestly can't stand selfish main characters, and everything Roar did in this book portrayed her as a selfish character to me. Because of that, I ended up rushing through scenes with Roar and Locke, desperate to find out what was happening back at the castle, where the only two characters that intrigued me were staying. Having said all that, I have to point out that I liked the world building. I thought the whole storm magic thing was unique. Too bad it wasn't enough to hold my interest.